The games will be played elsewhere. Houston on Saturday and Indianapolis on Sunday, to be precise. The folks who call Syracuse, N.Y., and its surrounding miles home can undeniably make claim as the basketball capital of the entire world this weekend. The Syracuse men’s and women’s teams both won their way to the Final Four of their respective NCAA Tournaments last Sunday. Returning from two bad knee injuries. Cool head with the ball. Hover over any gallery photo for a description. 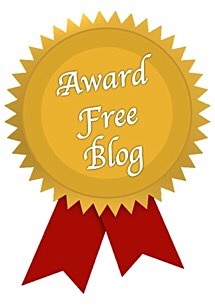 Click on an image for an enlarged slide show. Photos from my wide-screen. First the women thoroughly defeated Tennessee, coming after Friday night’s tight but pulling-away victory over top-seeded South Carolina. Coach Quentin Hillsman’s fourth-seeded team earned the right to meet Washington at 8:30 p.m. Sunday, to be televised on ESPN. They are an interesting and talented squad, with tall twins Briana and Bria Day, and determined guards Alexis Peterson and Cornelia Fondren, and sharp-shooting Brianna Butler and Maggie Morrison, and intriguingly named Isabella Slim. The winner of that game will meet either Connecticut or Oregon State, the team’s that match up earlier Sunday in Indianapolis. Connecticut is college women’s basketball’s super power. The Huskies could be vying for their fourth consecutive national championship and 11th national title under the direction of coach Geno Auriemma. That would break his current tie for the most national crowns ever with legendary UCLA men’s coach John Wooden. 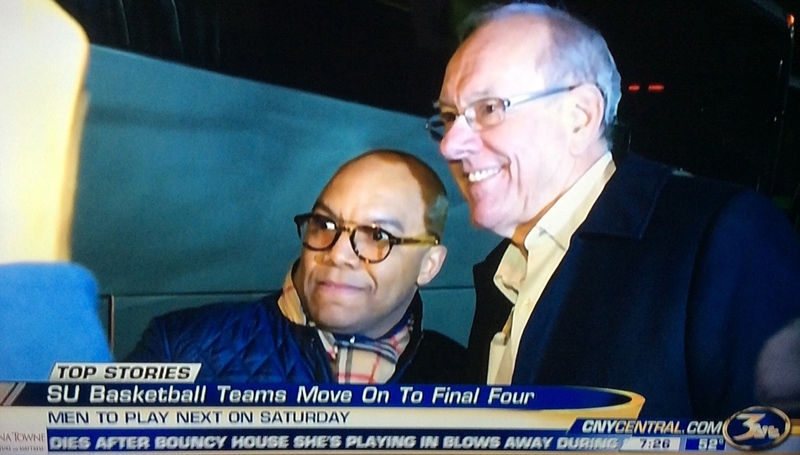 And should the Syracuse-Connecticut matchup happen, there are a couple of neat wrinkles. UConn’s best player is Breanna Stewart, a tall and talented senior some call the finest women’s college player of all time. Stewart’s hometown is North Syracuse. Further, Connecticut is the last program to land both its women’s and men’s teams in the Final Four. The Huskies won both titles in 2014, and before that, in 2004. Two other times Connecticut put both teams in the Final Four. This is the first time Syracuse has accomplished that feat because it’s the first time the women’s squad has made the Final Four. Which brings us to Coach Jim Boeheim’s 10th-seeded men’s team, and the way it came back Sunday night against Atlantic Coast Conference rival and top-seeded Virginia. Midway through the second half, the Orange trailed the Cavaliers by 15 points. That wasn’t much of a surprise. Yes, Syracuse had played well since barely making the tournament field, beating Dayton and Middle Tennessee State to make the Sweet Sixteen. Then Syracuse topped Gonzaga to earn the right to face Virginia, a squad the Orange had not beaten since leaving the Big East to join the ACC three seasons ago. That’s right, before this matchup, SU was 0-3 vs. UVA of late. And down by 15. Then seniors Trevor Cooney and Michael Gbinije gritted their teeth and ramped up the pressing defense, and freshman Malachi Richardson became a dervish on the offensive end, and fellow freshman Tyler Lydon hit a three-pointer after loosing a sneaker, and junior Tyler Roberson grabbed rebounds until fouling out and back-from-a-wrecked-knee Dajuan Coleman and freshman Franklin Howard shuttled in to do their best and varied things. All the way back, to the Final Four, their fourth under Boeheim. Syracuse won the national title in 2003. And now the Orange will play another ACC foe, North Carolina, come 8:47 p.m. Saturday. Syracuse will be loud and proud this weekend. Shirts are being made all over town. A spokesperson for fanatics.com sent me a photo of his company’s Monday morning. 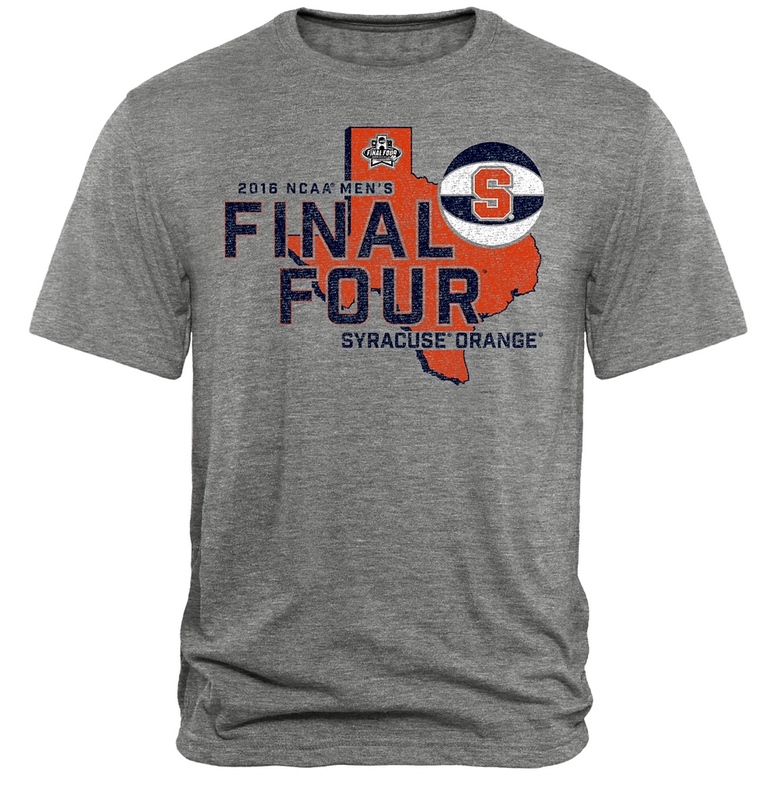 There are plenty more, from Syracuse’s Holy Shirts! and others. After all, this is the basketball capital of the world this weekend. What’s more impressive to you, the Syracuse women’s team making the Final Four for the first time, or men’s team for the fifth time under coach Jim Boeheim? Who are you rooting for in the men’s and women’s tournaments? Where’s your favorite spot to watch a college basketball game, and why? But, the highlight for me was after the game. London Perrantes, a UVa junior, sat on the bench, head in hands, crying. 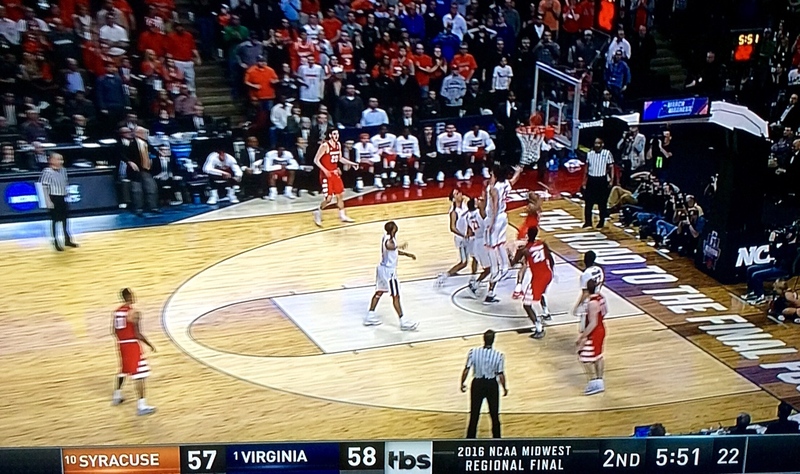 And, I saw a photo of Syracuse’s Michael Gbinije leaving his own team’s celebration to put his hand on London’s shoulder. It made me cry. And, it reminded me … games are games, but having “heart” is something that extends off the court and off the field. Good luck to your Syracusians this weekend, Mark … you earned it and deserve it! Fans have to remember that this is all for the players, TBB, and when London and Michael can share a human moment like that after a tough game, that is a life lesson they’ll both remember far after the score of the game is forgotten. Your nation is missing out on some great basketball in the women’s tournament, Ross. I wish you could see Breanna Stewart of Connecticut play. She’s special. Anyway … I watch women’s curling every Olympics. Love that sweeping! 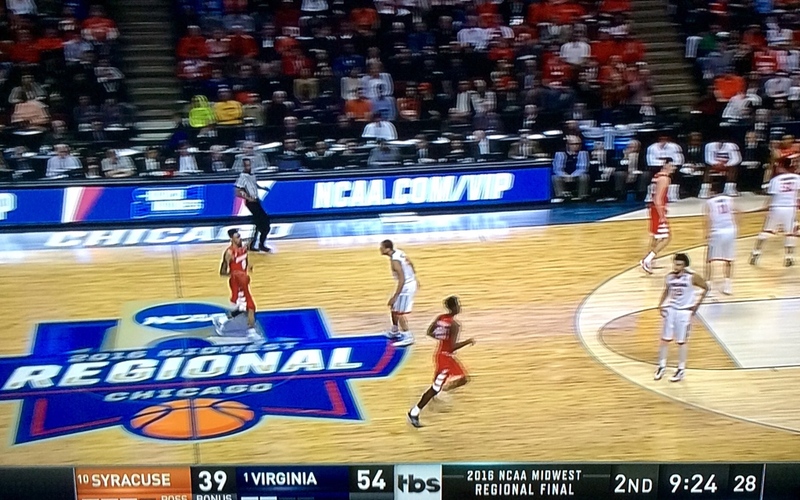 Whew, Syracuse is B-ball central. Sounds interesting Mark. Cool looking T-shirt. I need a new shirt I guess, Paul. None so far, though. i was thinking of you when i saw these wins. go orange! Last time the Orange men were in the Final Four, they lost to your Wolverines, Beth. This time you can root for my city team instead. 🙂 I was rooting for Michigan in your game, by the way.